Experience the quality of Rembrandt Charms. 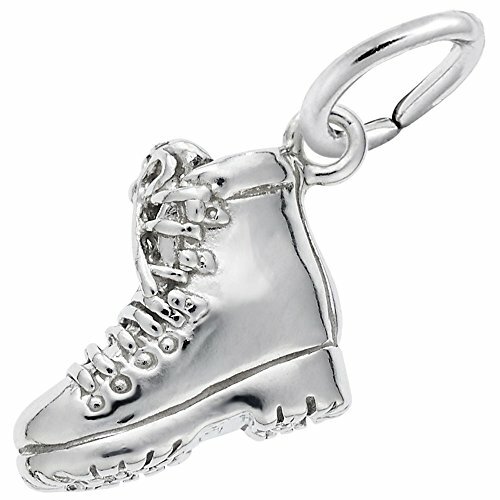 This Hiking Boot Charm In Sterling Silver is stamped with the metal quality mark and RQC trademark. All Rembrandt products have a Lifetime guaranteed. Sterling silver charms are plated with rhodium, a precious metal in the platinum family, which is used over our sterling silver to prevent corrosion or tarnishing. Please note the images above are enlarged to show detail. The charm is 12.33 MM long x 11.7 MM wide, it's handcrafted, made to perfectly fit your charm bracelet and will be great add-on to any charm collection.